Laparoscopic adrenalectomy has gained widespread acceptance. 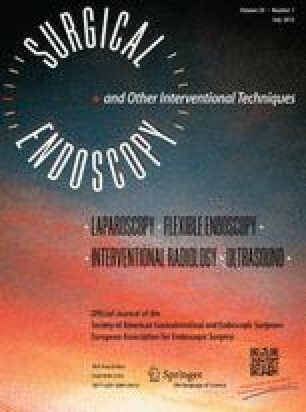 However, the optimal surgical approach to laparoscopic bilateral adrenalectomy has not been clearly defined. The aim of this study is to analyze the patient and intraoperative factors affecting the feasibility and outcome of different surgical approaches to define an algorithm for bilateral adrenalectomy. Between 2000 and 2013, all patients who underwent bilateral adrenalectomy at a single institution were selected for retrospective analysis. Patient factors, surgical approach, operative outcomes, and complications were analyzed. From 2000 to 2013, 28 patients underwent bilateral adrenalectomy. Patient diagnoses included Cushing’s disease (n = 19), pheochromocytoma (n = 7), and adrenal metastasis (n = 2). Of these 28 patients, successful laparoscopic adrenalectomy was performed in all but 2 patients. Twenty-three out of the 26 adrenalectomies were completed in a single stage, while three were performed as a staged approach due to deterioration in intraoperative respiratory status in two patients and patient body habitus in one. Of the adrenalectomies completed using the minimally invasive approach, a posterior retroperitoneal (PR) approach was performed in 17 patients and lateral transabdominal (LT) approach in 9 patients. Patients who underwent a LT approach had higher BMI, larger tumor size, and other concomitant intraabdominal pathology. Hospital stay for laparoscopic adrenalectomy was 3.5 days compared to 5 and 12 days for the two open cases. There were no 30-day hospital mortality and 5 patients had minor complications for the entire cohort. A minimally invasive operation is feasible in 93 % of patients undergoing bilateral adrenalectomy with 65 % of adrenalectomies performed using the PR approach. Indications for the LT approach include morbid obesity, tumor size >6 cm, and other concomitant intraabdominal pathology. Single-stage adrenalectomies are feasible in most patients, with prolonged operative time causing respiratory instability being the main indication for a staged approach. Presented at the SAGES 2014 Annual Meeting, April 2–5, 2014, Salt Lake City, Utah. Lan, Taskin, Aksoy, Birsen, Dural, Mitchell, Siperstein, and Berber have no conflicts of interest or financial ties to disclose.